If you’re like most company bloggers, writing is not your only job. This means having to shuffle your schedule to open a document and begin. It is intimidating, no matter how long you’ve been doing it. And even after making the time to write, there are all sorts of mental blocks, such as coming up with a topic, interviewing sources, doing research, or maybe just counting how many times the Word cursor blinks per minute (51 times). Even if you have a full queue of blogs, it is easier have writing time blocked off in your schedule to create the habit of writing than trying to crank out 3 blogs during the week sometime. There should not be a day that you don’t write at least a paragraph of content. Once it is habit, the ideas will come more readily and sitting in front of a blank document won’t be as intimidating. This is part of making it a habit. Spend time in the morning just getting your thoughts onto paper. Do this before getting bogged down with meetings, emails and work. Later in the afternoon, reopen the document and edit if for style and grammar (link to respective blogs). Set aside 30 minutes to discuss the content that you want to write with your colleagues from a different department. What’s new in the industry? How can you apply that to your company? What do your consumers need to know? Have a running document on your computer or phone, or even a notebook, where you keep ideas. Knowing you have unlimited time with an article is debilitating. That’s why people become procrastinators; they want the thrill of deadline to force them to write. Set a timer for 30 minutes and write everything you can down. After that time, save and close until it’s time to edit. When you feel like you really absolutely cannot write another post, shake up the process. Write an outline and fill it in or start with your quotes and write transitions around them. If you’re stuck on the intro, write it last. You don’t have Self-Control? Download it. This app, called Self Control, will block social media, your favorite websites, your email, or anything you put on the blacklist for a period of time (see step 4). It will make you focus. No time? No ideas? It’s time to cheat and recycle content. 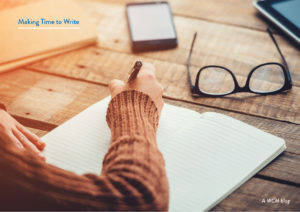 One of the most helpful exercises for a budding writer is to practice writing an article two or three different ways, or combine content from related blogs for a new twist. Rebuild your content when you’re pressed for time and ideas.